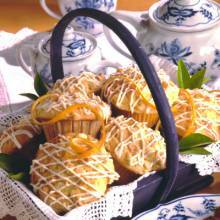 A drizzle of white chocolate on top gives these muffins just the right amount of sweetness to make them a true breakfast treat. Serve them for a quick morning bite, or pass them around as an appetizer for a hearty brunch. Preheat oven to 375 degrees F/190 degrees C. Grease or paper-line 18 muffin cups. Microwave remaining morsels in small, heavy-duty plastic bag on medium-high (70%) power for 1 minute; knead. Microwave at additional 10- to 20-second intervals, kneading until smooth. Cut tiny corner from bag; squeeze to drizzle over muffins. Muffins are best served warm.